A lady's two favorite things, shoes & handbags, the only thing that's missing is jewelery but we've got you covered there too. (Check out Lace Jewelery). 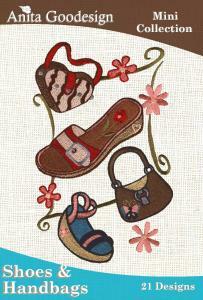 This collection offers a fashionable array of shoes & in-style handbags to decorate with. The full color catalog includes the front and back covers from all of our design collections plus sample project ideas. The tutorial is the greatest feature of our collections. Whenever we do a complicated project we include a step-by-step photo tutorial on how to complete the project. You will never have to figure anything out for yourself again. If you've ever had trouble re-sizing designs, those days are over. We include a professional re-sizing program. All digitizing, manufacturing, packaging, printing and administration is done entirely in the U.S.A. Need Support for Anita Goodesign collections? Click Here. All designs pictured are not compatible with all sewing systems. Please check your hoop size before purchasing. Designs may be sewn and sold in limited quantities. See inside the pack or contact us for details.